Q. I found your column about the LectroFan micro Wireless Bluetooth speaker/sleep sound machine quite interesting. I have been thinking about trying one of these devices for quite some time, just never got around to it. I am looking for a more permanent in-room solution rather than a portable rechargeable unit. Are there any others you can recommend? A. Given my good experience with the $35 LectroFan micro Wireless and the way it has helped me personally, I have done a lot of research on the subject since the last column was published. 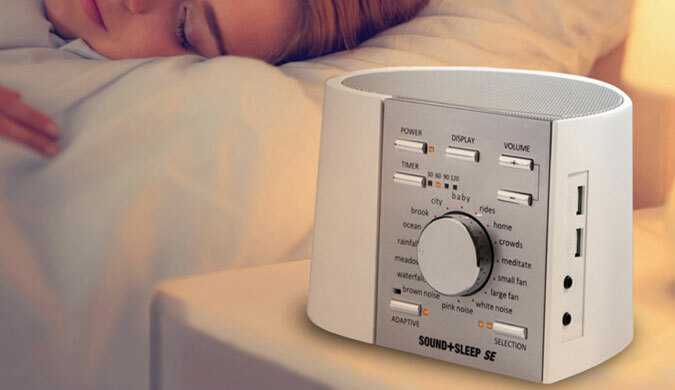 Good sleep sound options are available from $0 to $149. I will start with free and work my way up. You may not need to buy a sleep sound machine at all. If you have a Bluetooth speaker you can use it with an app to make it a sleep sound machine. (You may even be able to use the phone or tablet speaker on its own, though I doubt there would be enough volume to mask outside sounds, which is one of the purposes of these machines.) Searching the iTunes App Store and Google Play yields lots of choices, with the free versions of Sleep Pillow Sounds and White Noise Ambience Lite garnering excellent reviews. The downside to this approach is the necessity of having your phone or tablet using power all night, which is not a problem as long as it stays plugged in. If the cable comes out of the phone or charging device, you could wake up to a dead phone and perhaps lose your alarms and oversleep as a result. This is an outside chance, of course, but something to consider before going this route. This does not sound like what you are looking for anyway, but I wanted to include the information to help other readers of the column. The top-of-the-line sleep sound/white noise solution comes from ASTI, maker of the LectroFan micro Wireless. The $149 Sound+Sleep SE can create over 60 sounds to enhance sleep and relaxation as it masks outside noise. The waterfall soundscapes in particular are very complex and incorporates over 100 unique water recordings to create a unique, non-looping experience. I found the waterfalls, brook, ocean, rain and fan sounds to be very effective. Some of them, like crowds and city, did not work for me and I did not have use for the meditation or baby functions. Still, it is nice to have so much variety and I may find uses for the other sounds someday. A nice bonus to the Sound+Sleep SE is the two built-in USB charging ports, which make for a perfect bedside charging station for your phone and tablet. If you want the best, this is it and it is worth it.